Sarah Ann Longbottom was born on September 20th 1837 at Louth, South Lincolnshire, England. She was more fortunate than many young ladies of her day, as she was sent to a private school. She later worked in her father's drapery. Undoubtedly this early experience of the business world was useful to her many years later when the Shepherds took over the Port Albert Store. She married John Shepherd on July 10th, 1858. He wasn't the most robust of men. A short time after marriage, because of a deteriorating chest condition, John's doctor suggested he emigrate from industrial England. Early in 1862 they became interested in a venture to emigrate to New Zealand with a group of non-conformists, who later became known as the Albertlanders. The idea was to send out a special complement of people belonging to the non-conformist faith to found a colony of their own. The quality of the settlers, as regards industry and character, was of the highest. Though not of a farming type, nor indeed overly venturesome, John and Sarah were soon persuaded by the many advertisements setting forth the wonderful opportunities for colonists in far off New Zealand. John was a studious young man and soon read everything he could find out about the new land. His two single sisters were also persuaded to join the growing group, and were a tremendous help to John and Sarah with their two children on the voyage out. Port Albert was to be an important town in the new land. On paper it looked like a model town with sections allocated for schools, shops, and churches. The optimism of the immigrants overlooked any practical aspects of the location such as the bush and fern everywhere. Such enthusiasm was shown in the venture that as each group came to London, special farewell meetings were held. On May 29th 1862, the Shepherds, their two young children, John’s two sisters, and Sarah’s parents and some others of her family, sailed from the London Docks in the Hanover where they were farewelled by a crowd of 15,000 and a brass band. They were bidden 'God Speed' by C.H.Spurgeon and other well known preachers. This day has been celebrated in Port Albert as Anniversary Day ever since. In fact, Sarah Ann almost didn't make it onto the ship. Just before the ship sailed she decided to go ashore to purchase medicine for the two children Alfred and the baby Henry who had contracted colds. On returning to the ship, she saw to her consternation that the gangplank was already raised, and was in despair until two men standing nearby taking her by the hands lifted and swung her on board. During the whole of the voyage she was very ill, and could not stay below so had a hammock slung on deck. At times her very life was in danger. The whole trip was very rough, the crude quarters and poor food making life an almost intolerable misery for seasick passengers. Before Tasmania was sighted on 6 September, the Hanover was battered by a violent storm. The weather increased to a hurricane during the afternoon. John's sisters, were caught by a wave, thrown down and washed from one side of the ship to the other, with a couple of cows. The cow-house was washed overboard. The Hanover docked at the Wynyard Pier in Auckland on the 17th September after a voyage of 106 days, that is 15 weeks. On arrival, they fondly thought that their troubles were over, but they were soon disillusioned, for they found that no arrangements had been made to get them to Albertland over some 70 miles of very rough going. For Albertland in the spring of 1862 was a far-away, and rather mythical land, and they soon began to understand the half-amused, half-pitying looks that the citizens of Auckland gave them when they spoke of where they were going. Many different routes to Port Albert were taken by the settlers. The Shepherds went by small boat to Riverhead where they were accommodated in a tent village, one of the tents being large enough to hold 150 people. From here they went across country to the Kaipara. It took several weeks to find bullock drays to move the Albertlander's 150 tons of luggages. The track was just a muddy gap through the bush, with many trees lying where they had fallen. It was so rough that most people walked alongside the bullock wagons carrying their goods but Sarah Ann being still too ill to walk, was hoisted on top of a load of goods and tied down to keep her from being thrown off by the rough going. The lovely clothes and books so carefully brought from England were then almost ruined by mud and rain. One settler complained that in two days the Portage trip inflicted more damage on his valuable imported sheep than the whole voyage from England. Incessant rain and lack of maintenance caused the clay track to become a quagmire. Once at Helensville, they had to wait several weeks for a boat to take them and their goods to Port Albert where they found even the town lots covered in trees and ferns and many miles from any road. The Shepherd’s sent their heavy goods by cutter around the North Cape. Unfortunately, this was srecked and they lost many of their precious possessions. Stories abound of the trips to Port Albert, of boats being stranded, putting passengers off at the wrong destination, and of many who were so fed up waiting, that they decided to walk. Once at Port Albert although trials and tribulations were many. John was a journalist and printer by trade and was totally unaccustomed to the rough life the bush offered. There were also many compensations for the early settlers who had the pleasure of seeing plots of ground redeemed from the wilderness and made into gardens which even in that first summer, supplied the people with a few vegetables and flowers. Early in 1863, before sufficient wood had been cut for their first house, Sarah Ann gave birth in a whare, to Mildred, the first white child born in the settlement. By this time they had on their own land a whare built of nikau. It was two rooms divided in half by a curtain. About the same time a calf was born. The rain came and the calf was too precious to be left out in the wet, so it had to be brought inside also. A woman passing that way was storm-bound and so she was inside also. The birth of this child helped in making friendships with the Maori neighbours. It was fortunate the Maoris were friendly and often brought peaches and kumeras to trade. Tracks were widened and eventually became roads of sorts. Soon there was the compensation of seeing plots of ground redeemed from the wilderness growing flowers and vegetables. At first survival was predominant in their thoughts and actions and in this connection there are stories of potatoes already planted being dug up and rationed out. Possibly the milder climate or the very roughness of the new outdoor life, toughened John. On one occasion, during a period of near famine, John walked to Mangawhai on the east coast, and carried home a fifty pound bag of flour on his back. (Some references say it was Sarah’s father Barnard Longbottom who carried out this feat.) The journey took him two days, and not being a very robust man, it was only the thought of his family's distress that spurred him on. This happened in 1864 when the cutter “Advance” which had goods on board to the value of £1500 was due at Port Albert in the spring. It was not until August that it was discovered to have founded so the relief vessel did not reach the hungry settlers for another month. But the new settlement did not progress as had been planned. Many became discouraged by the impossibly difficult conditions. Some returned to Auckland, or their homeland, England. However, by the spring of 1863 steady progress had been made and there were 80 families. Bush and fern were cleared and grass sown. Paddocks were fenced and the first cattle did well. 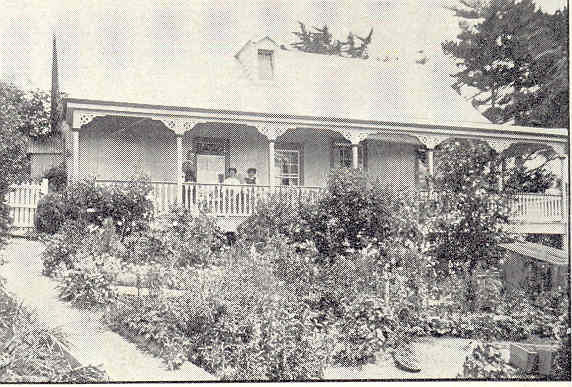 Soon each homestead had fruit trees, and orchards were planted. It was reported in February 1866 that most of the 100lb weekly quota of South Albertland butter was carried overland to Riverhead. How did they prevent it becoming an oily mess in the hot spring and summer? Both John and Sarah Ann were stalwarts of the first Methodist Church in Port Albert and John was one of the early local preachers. This faith has been passed on to many of their descendants. A store and boarding-house was built near the landing and John became manager. By 1877, trade with Auckland had increased and a regular steamer service was commenced. Large quantities of kauri gum were shipped from this district. John and Sarah managed the Co-op store until 1890 when they purchased the business, running it for many years before selling it to their son-in law, George Bennett, who ran it for many years before handing it onto his sons who ran it until 1991 when it was closed down. John and Sarah Ann retired to Auckland. Sarah was the dominant partner in the business, and made the occasional journey to Auckland. Her business trips usually meant an opportunity to see some of the girls in later years, as she stayed a few days in town to buy for the store and arrange other matters which could not easily be done by post. John took a prominent part in the public life of the settlement holding a number of different positions in the Provincial Council days. He also was a J.P. and the Registrar of Births and Deaths. Throughout their married life, they always found others worse off than themselves who needed help and comfort. They had many years of rugged self help and community service. Sarah Ann Shepherd began married life as a small trim bride of 21 years and proceeded to love, honour and obey her husband. Although she remained slim and her integrity was never questioned, she later became the dominant partner. It was Mrs Shepherd who really managed the store and Mrs Shepherd whom the Maoris of that district loved and honoured. In widowhood, she exerted an influence over those of her 12 children that survived, and liked to think that she could direct her family of grandchildren and great-grandchildren in the ways they should tread. My great-grandmother, Sarah Ann died in 1919. Her husband died in 1899. The Shepherd's house at Port Albert. Reenactment of the landing at the 125 years celebration in 1987. 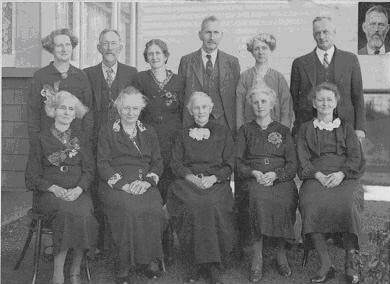 The Shepherd family in 1940 Kate, Barnard, Constance, William, Olive, Herbert (inset John Alfred) Edith, Sarah, Mildred, Emily, Bertha.